Today is the last day for the Obama family vacation to Hawaii. Yesterday, President Obama and family visited the East-West Center to view the anthropological work of his mother, Stanley Ann Dunham. They also visited the National Memorial Cemetery of the Pacific at Punchbowl to visit the grave of his grandfather, Stanley Dunham. They also spent time at the beach and President and Mrs. Obama went out to dinner. So we'll see what the Obamas have in store for their final day before returning to DC to get back into their normal routine on Tuesday morning. They'll take a red-eye flight home from Hawaii tonight, leaving at 5:00pm Hawaii time. They'll fly through the night and return on Tuesday morning. As his Republican rivals criss-cross a chillyIowa landscape this week, President Obama is in vacation mode –spending time with his family including hiking, golfing with friends and visiting troops in his native Hawaii. But he is keeping a noticeably low profile. The White House reminds this is a working vacation as the president each day receives his daily briefing and advisors follow domestic and world developments. The administration is also presumably preparing the president's State of the Union address to Congress which is set for January 24th. The president's holiday vacation was delayed just days before Christmas in his last interaction with Congress when House Republicans "blinked" and voted to extend the payroll tax cut another two months ending a stalemate with the White House. Before President Obama boarded Marine One to leave for his annual holiday trip to Hawaii, he made a surprise stop to wish the press corps Christmas greetings. "Merry Christmas! Enjoy the time with your family," he told reporters and cameramen as he shook hands with each person. He spent about ten minutes greeting those who cover his every move. The relationship between the White House press corps and the president can sometimes be adversarial but on this occasion it was strictly a time for holiday cheer. Earlier during his statement in the James Brady Briefing Room, the president wished "Happy Holidays" to several groups of people, including the White House press corps. "So I want to wish everybody a Merry Christmas, happy holidays, a happy New Year to you and your families - and that includes everybody here in the press corps," he said. "I know you guys have been working hard, and your families will be happy to spend a little more time with you over the next few days." It almost felt like a deja vu. Last year, the president did the same as he boarded his helicopter before departing for Hawaii. Maybe he's starting a new holiday tradition! 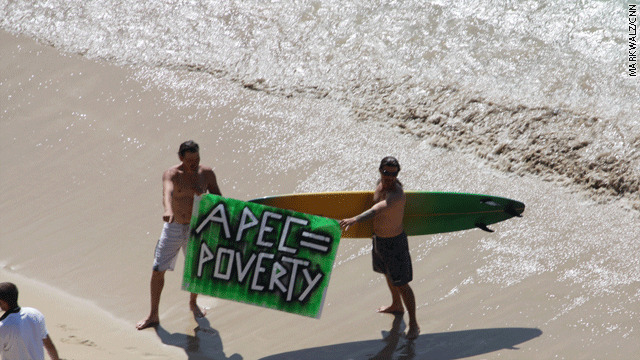 Protesters took to the beach in board shorts and bikinis to protest APEC. About 10 sign-carrying protesters marched down the beach in Waikiki to the Westin Moana Surfrider Hotel where the White House Press Corps Filing Center is located. Tourists floated along in inner tubes watching the protests. CNN 'birther' investigation: Obama born in the USA. Period. Editor's note: Tune in to "AC360°" on Tuesday beginning at 10 p.m. ET to see the remainder of Gary Tuchman's investigation into President Barack Obama's birthplace. A new CNN investigation reveals what most analysts have been saying since the "birther" controversy erupted during the 2008 presidential campaign: Obama was born in Hawaii on August 4, 1961. Period. While the president has made light of the controversy, the question remains political red meat for some of his critics. A recent CNN/Opinion Research Corp. poll showed that nearly 75% of Americans believe Obama was definitely or probably born in the United States. More than four in 10 Republicans, however, believe he probably or definitely was not born in America. (CNN) - Just hours before he was scheduled to fly back to Washington, President Obama, his daughters, and other friends and family made a vist to the Honolulu zoo. As they walked by a primate exhibit that included White-Handed Gibbons, and Ruffled Lemurs, the president's youngest daughter, Sasha, yelled "they are so adorable'" when she saw the lemurs. 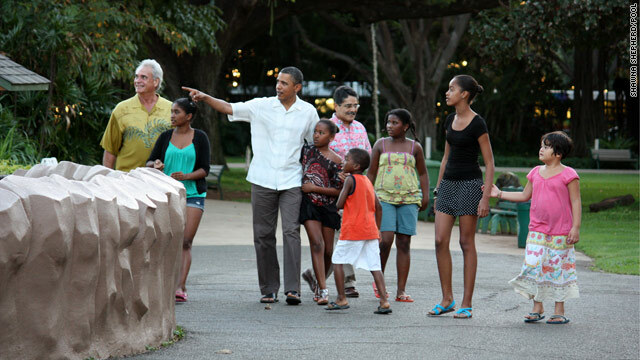 Obama's sister Maya Ng-Sotero, her husband and their children were part of the delegation at the zoo along with the president's friend from Chicago, Martin Nesbitt, and his family. The group was also joined by a zookeeper who showed them around. Before the visit to the zoo, Obama and his daughters visited the National Memorial Cemetary of the Pacific at Punchbowl in Honolulu where Mr. Obama's grandfather is buried. Honolulu, Hawaii (CNN) - Trying to eke out one more day of vacation in warm Honolulu before heading back to winter in Washington, President Obama and his family hit the beach and made one more stop at their favorite shave ice shop, Island Snow. The Obamas, family friends Marty Nesbitt, his wife Anita Blanchard and their kids, spent the day at Pyramid Rock Beach located on Marine Corps Base Hawaii in nearby Kaneohe Bay. The group made a quick stop for shave ice before returning to their Kailua vacation rental. White House chef Sam Kass was also spotted. President Obama ordered a regular cone with green and red-colored shave ice. He greeted onlookers near Island Snow who were kept at a distance by the Secret Service. 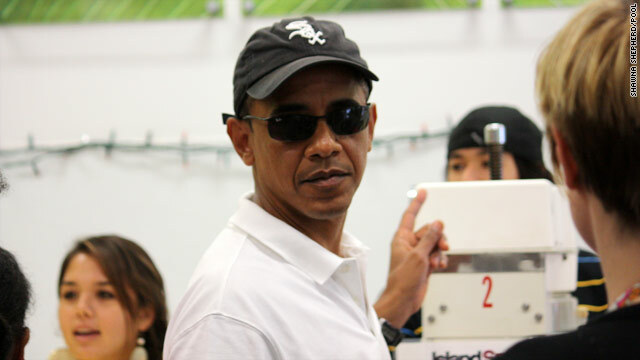 Obama, wearing sunglasses, a White Sox baseball cap, a polo shirt, shorts, and black flip-flops, was greeted to cheers and clicks of cameras and cell phones. 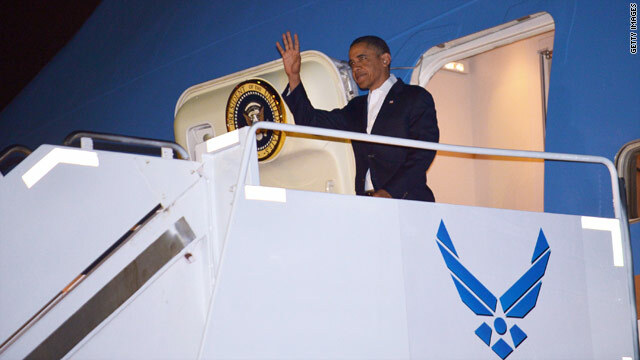 The Obamas will leave later in the evening Monday and arrive back in Washington Tuesday morning. One last shot of warm weather and sunny skies before heading back to Washington for the start of a new Congress and what could potentially be a frigid welcome. HONOLULU, Hawaii (CNN) - I thought it was funny when The Washington Post joined various CNN anchors in teasing me about creating "something of a brand covering [President] Obama's vacations." 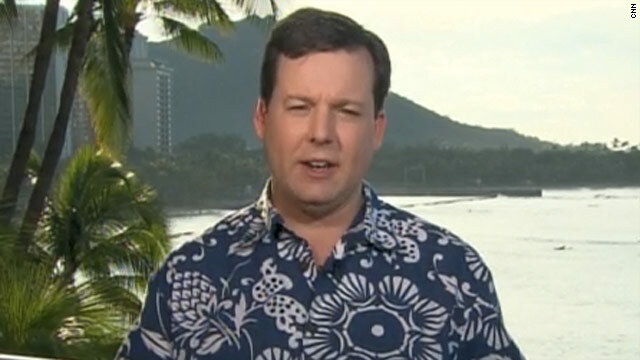 In a tongue-in-cheek piece, the Post's Perry Bacon wrote that I've been trading the "traditional news correspondent garb of a suit and tie for a seemingly endless variety of multi-colored Hawaiian shirts and flip-flops." OK fine, you've got to be able to laugh at yourself. And what's wrong with injecting a little fun into live reports? That's why I used to scoop up big belt buckles in Texas to cover then-President Bush's vacations in the sleepy town of Crawford. Now that a new president has brought us to a more exotic locale, the last thing I want to do is look like Richard Nixon and wear dress pants and wing-tip shoes to the beach. But then I stopped laughing this morning when one of my colleagues at another network asked me in a semi-serious tone, "Did you see that editorial about you in the Honolulu Star-Advertiser?" I thought he was joking until he handed over the offending newspaper editorial with the headline, "Reporting live, in my Hawaiian shirt." 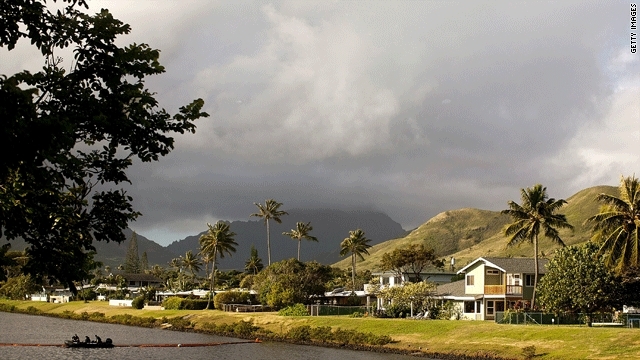 The short, kind-of-whimsical editorial wondered aloud whether there's a downside to Obama having his annual holiday vacation on the Hawaiian island of Oahu in the tiny town of Kailua, about a 30-minute drive from the tourist-friendly Waikiki Beach that you see in our live shots.